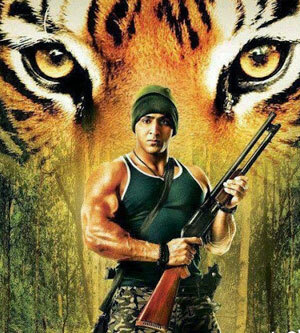 Rediff.com » Movies » Review: Nothing to Roar about! Review: Nothing to Roar about! You'd be naive to go into this one looking for top grade acting or direction, says Paloma Sharma. A wildlife photographer on an assignment in the Sunderbans finds a white tiger cub caught in a poacher's trap. In order to protect the cub, he takes it back to his residence in the nearby village only to face strong opposition from his guide Madhu (Pranay Dixit) and the rest of the villagers. The photographer Uday (Pulkit Jawahar) is warned of dire consequences by the superstitious villagers but he dismisses them and until the forest warden (Achint Kaur) forces him to part with his find, he keeps the rare white tiger cub in a cardboard box. The wildlife photographer tries to restrict the movement of the tiger cub by putting him in a cardboard box that's so flimsy that my two-month dog would have torn through it in a jiffy. Never mind. Let us just assume that this a well-behaved little tiger whose squeals of 'Mere paas maa hai' are ignored by both Uday and the forest guards who take him away. Later that night, the tiger's mother enters said village after following the trail of her cub's scent and mauls to death all those who stand in her way, including Uday. Satisfied with her work, she decides to call it a night without further following the cub's scent to the warden for some reason, and retires to the jungle with Uday's body in tow. Enter: Uday's commando brother, Pundit. Pundit (Abhinav Shukla) takes the first boat to the Sunderbans to avenge the death of his brother, who was killed by a tigress, who wanted revenge for the supposed abduction of her cub. This cycle of vengeance is so messed up! Pundit brings with him his team of commandos (one token female with a foreign accent in shorty-short shorts and cleavage baring tops included, thank you), in the style of John Rambo. They enlist the help of the best tracker in the Sunderbands, the Jhumpa (Himarsha Venkatsamy), who probably had to borrow clothes from the female commando, CJ. Inspired by the two, the male members of the team have no problems going shirtless and there are enough toned torsos on display to cover up for the non existent story for a bit. Let's face it, Roar is a two-page essay stretched into a two-hour film. But if you're a sucker for borderline B-grade action/adventure thrillers or if you go 'awww' over anything with four legs, fur and a tail, then Roar will not disappoint you. I'm going to give an extra half star just for the cute cubs. Roar's strengths lie in the novelty of the concept and the judicious use of CGI. Sure, the special effects could have been better but compared to standards set by its contemporaries, Roar doesn't far badly. The absence of distracting songs and dance is a welcome change. Well-researched art direction as well as the breathtaking wide angle shots of the Sunderbans add to its pros. You'd be naive to go into this one looking for top grade acting or direction but if you have liked any adventure film starring Dwayne Johnson, then the Sunderbans are the place for you.